If you’ve ever cringed at your neighbor for parking their Carrera 911 out on the street during the winter, then we’re fairly confident that you value taking proper care of your very own Porsche. Do you have a dedicated garage space for your favorite German sports car, or do you even wash and wax it just about every week? If so, then we think that you’ll get along quite well with our independent Porsche specialists here at HOUSE Automotive. Finally, A “Porsche Mechanic Near Me” Who Cares! You see, our end goal is not simply just to fix your car. Our independent Porsche repair experts in Pasadena and the greater Los Angeles area share your passion for a fun and inspired driving experience. We believe that driving should be an engaged and exciting experience, and we also believe that our fellow Porsche owners deserve an independent Porsche mechanic team that’s as excited about your ride as you are. So, when it comes to blabbing on about that exhaust upgrade or bragging to us about the latest cruise up in the foothills, go ahead and run your mouth about it, because we’re all ears when it comes to anything Porsche-related. 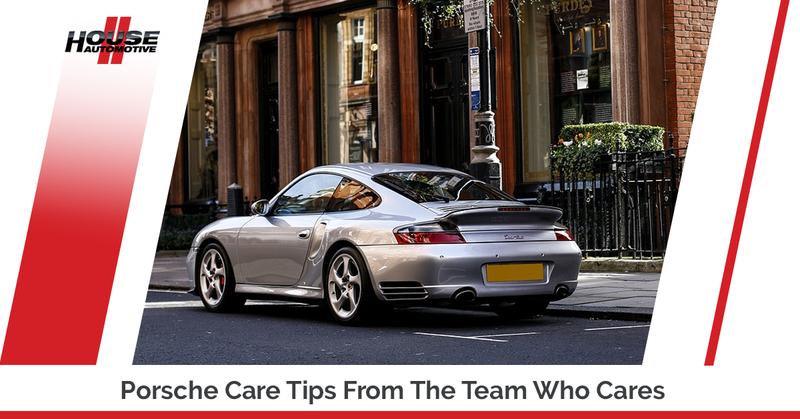 Because we care so much, our local Porsche mechanic in Pasadena is going to cover some care tips to help give your own Porsche the special treatment that it deserves. Learn more about our signature approach to Porsche repair and maintenance by visiting here. Save the snacking for your kitchen or dining room, and for drinks other than water safely contained in a bottle, try to avoid consuming these things in your car. Disciplined car owners are able to keep the interior of their vehicle in mint condition by outlawing fast food and other smelly, greasy items from entering inside. We understand that this is easier said than done (as life is often unpredictable and sometimes you might find yourself doing things in your car that you probably shouldn’t be), but so long as your Porsche isn’t your daily driver, you should be fine. By keeping it to just water safely contained in a bottle, the resale value of your Porsche will thank you later. Plus, it’s nice for the interior not to smell like cheap food, unless it’s In-N-Out Burger, of course. In general, this is good to know (hopefully drivers of any sort don’t need to be reminded that they should be gassing their car when it gets low on fuel), but filling your tank when it gets around halfway to one-third full is a good idea. Why? Well, the quality of the gas in your tank tends to decline as you burn through it. By the time your gas light comes on, the fuel you’re using is usually chalked-full of sediments and other bottom-of-the-barrel fuel qualities. To run on the most optimal gas, consider filling up when you’ve burned through about half a tank of gas. If your 911 is rated for a certain octane of fuel (this information is usually found near the gas cap), please use the manufacturer-recommended octane. That is to say, do not use the watery, discount 85 octane fuel at the Walmart pumps just to save a burrito-worth’s money at the pump. Using lower-quality fuel than what the car was built for over the course of even just a few weeks or a few months can negatively affect your engine life, oil quality, fuel economy, and even performance aspects of your vehicle. Just like our bodies, certain high-performance vehicles (i.e. most Porsches) are designed to run on high-quality fuel, so use it! Besides, if you already own a nice Porsche, chances are that you shouldn’t be attempting to save a little money by using sub-par gas. The best way to ensure optimal mechanical performance from your Porsche is to visit your friendly independent Porsche mechanic team here in Pasadena. HOUSE Automotive performs all routine maintenance as well as major fixes and everything in between for virtually all Porsche models. We respect our fellow Pasadena Porsche owners who truly care about their vehicle, and we’re happy to provide excellent independent Porsche repair services to the greater Los Angeles community. For independent Porsche service that you can truly trust, get in touch with HOUSE Automotive now!